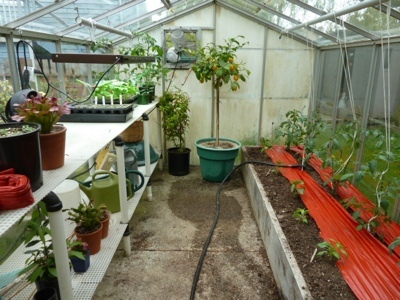 My Home and Garden: Tomatoes and peppers planted in the greenhouse. Will red plastic make a difference? 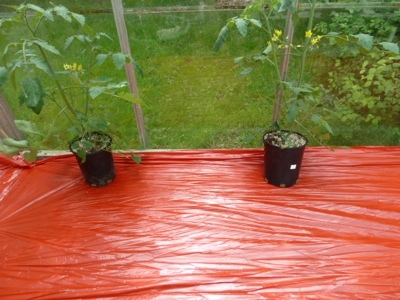 Tomatoes and peppers planted in the greenhouse. 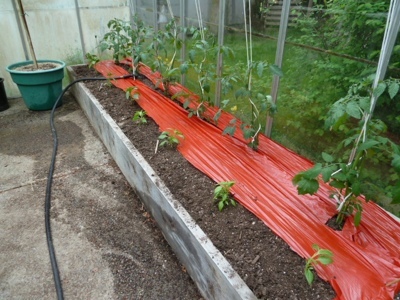 Will red plastic make a difference? 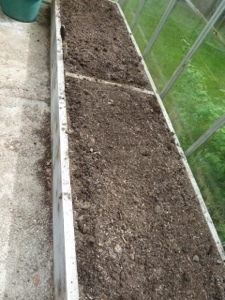 This afternoon I prepared the garden bed in the greenhouse for the tomatoes and peppers. Of course I deployed my secret weapon. Alpaca poop. Laying the red plastic was a fiasco. I was actually muttering curse words on several occasions. Here is a chronology of the process. Laid a sheet of red plastic on bed. 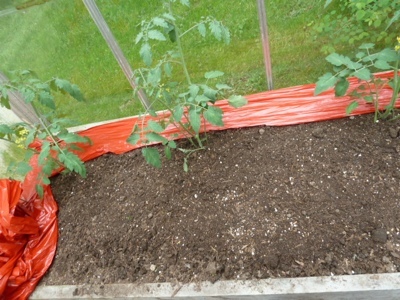 Cut a hole for the tomato and started excavating. A much as I dug, the soil just kept falling from the sides into the hole. After spending about 15 minutes digging, I gave up. Peeled the plastic back. 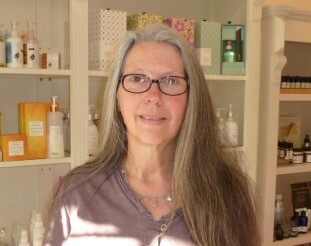 Cut it into strips and started anew. 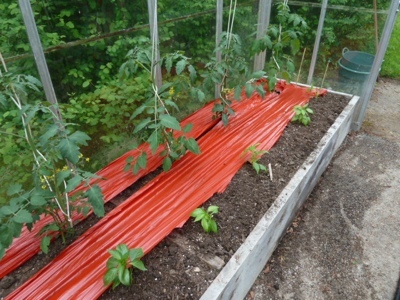 Finally, red strips and clothes pins saved the day. What is the purpose of the red plastic, Erin? Is it to conserve moisture? To reflect sunlight? or what? Hi Mark. 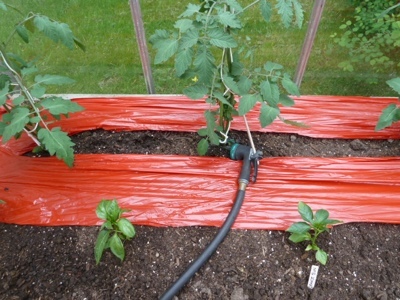 The red plastic is supposed to reflect back on the tomatoes giving you lots more tomatoes and more vigorous strong plants. I hav never used it before, so we will see. 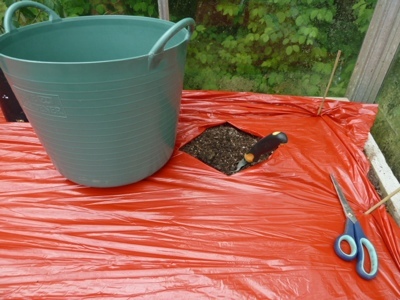 The other reason I like it, is it will keep the water under the plastic so I won't get the leaves wet. We get blight here on the west coast from water bouncing up off the soil to the leaves. The plastic will help with that. Erin...you gave me a chuckle. I tried this same thing years back using black plastic with the same results!! Your tomato plants are huge!! and have blooms already! Wow..can't wait to see them climbing up to that pole. What variety are they? In hindsight it was pretty hilarious. A comedy of errors. Those are Sungold tomatoes. 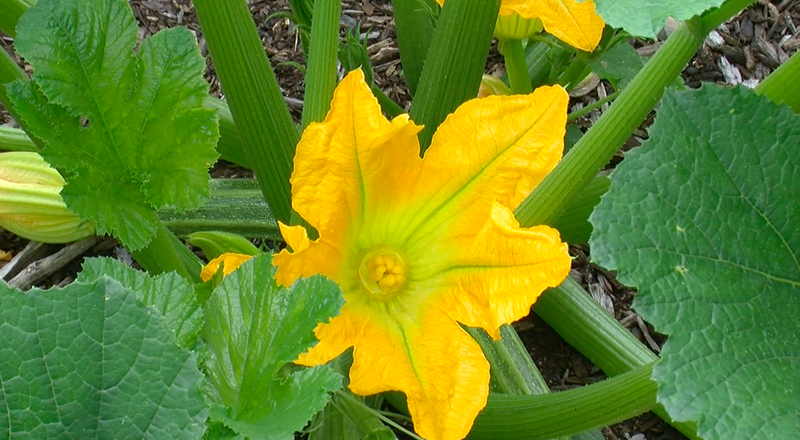 I like to grow OP varieties, but Sungold are SOOOOO delicious, I opted for just those this year. Nothing else really grew well last year. These were started on a heat mat and under lights. One of the plants has small tomatoes on it. Amazing. OK, I see. What you really should do is try some with the plastic, and some without, to see if the stuff does actually make a difference.